We have a large selection of cut flowers grown right here on our family farm. Cutting starts mid-May (weather dependent), and lasts until late October. The local growing conditions help us produce high quality, breathtaking flowers that are intense in colour, and are not the typical florist type cut flowers. 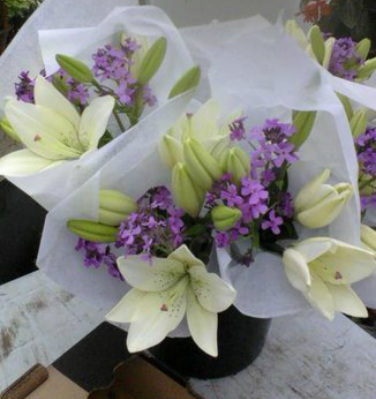 The flowers are available in bunches, or custom mixed suited to your individual needs. The selection changes throughout the season with constants such as lilies, sunflowers and zinnias. Customers rave about the uniqueness and value of our cut flowers, which can be found at the Brockville Farmers Market, and are also available at the farm (please call ahead or by chance).